Have you heard your friends talking about taking their kids to a chiropractor? Are you wondering why they do so or if it’s safe? When is the earliest a baby can be checked by a chiropractor? Let us talk you through a few of the most frequently asked questions we get in our office regarding chiropractic care for infants. Birth is a tough process! Whether a baby is born vaginally or by cesarean section, they still went through a stressful birthing process that put a lot of strain on their little body. Descending through the narrow birth canal where they are eventually pulled out by a doctor/midwife or being pulled out head first in a c-section has detrimental effects to the upper cervical area of a baby’s spine. Just like how the mother should be cared for throughout pregnancy and the postpartum period, it’s equally as important to have baby’s spine checked for misalignments following birth to ensure that their nervous system is functioning properly. This may help prevent nursing issues, colic, reflux, and constipation! When is the earliest a baby can be seen by a chiropractor? The earliest a newborn can be checked by a chiropractor is the day they are born! 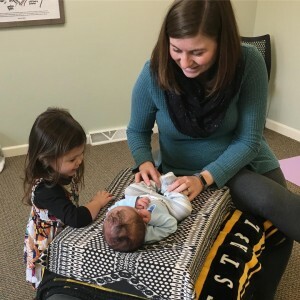 Babies can be adjusted immediately after birth, however, many of the parents in our office choose to bring their little ones in within the first 2 weeks following birth. 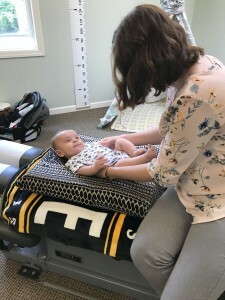 They want to make sure that their new little one can adapt and thrive in their new environment by encouraging a properly functioning nervous system through chiropractic care. Are babies adjusted the same way as adults? Babies are not adjusted in the same way adults are adjusted. We often tell parents that we use the amount of pressure you would use to test the ripeness of a tomato. It doesn’t take as much to adjust infants because they don’t have the built up muscle tissue and stress that a typical adult deals with on a daily basis. There is never any twisting or cracking with babies, and we are happy to demonstrate the amount of pressure we will utilize for a baby on your hand to give you a better idea of what to expect. Many times, babies will sleep right through their adjustments because they are so gentle! Chiropractic care for children is safe and has been shown to be safe through various studies. Our goal is to provide gentle and specific adjustments for all of our practice members, no matter their age. Millions of adults and children continue to experience the amazing benefits that this safe and efficacious form of healthcare provides. Interested in scheduling a complimentary consultation to learn more? Click here.